A high ankle sprain is an injury to the strong ligaments above your ankle joint that attach the tibia (shin bone) to fibula (outside leg bone). 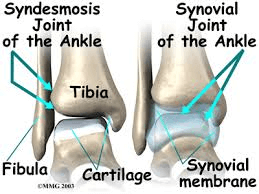 This strong fibrous joint is called the ankle syndesmosis and it commonly has very little mobility. This injury occurs in 1-11% of all ankle sprains, however, 40% of patients report ankle instability six months post-ankle sprain. So, although it is less common than a general ankle sprain it is more disabling. The most common way of getting this injury is in a tackle where the foot is fixed, and the leg/body is twisted violently. Pain is normally found above the ankle joint. People tend to feel pain with walking and any pivoting movements with the foot planted on the ground. Your Physiotherapist will clinically assess your ankle stability. If they suspect a severe high ankle sprain, they may recommend a weight-bearing X-ray, MRI, and/or CT scan to confirm the diagnosis. With regards to treatment, placing the foot in a moon boot for a certain period of time (depending on the severity of the injury) will allow the ligament(s) to heal and by keeping the ankle in neutral position this will reduce any stress to the joint and increase the recovery rate. Afterwards, types of rehab exercises will include mobility, strength, proprioception, hopping, running, and agility. James is available for appointments at our Northbridge and Willoughby locations.